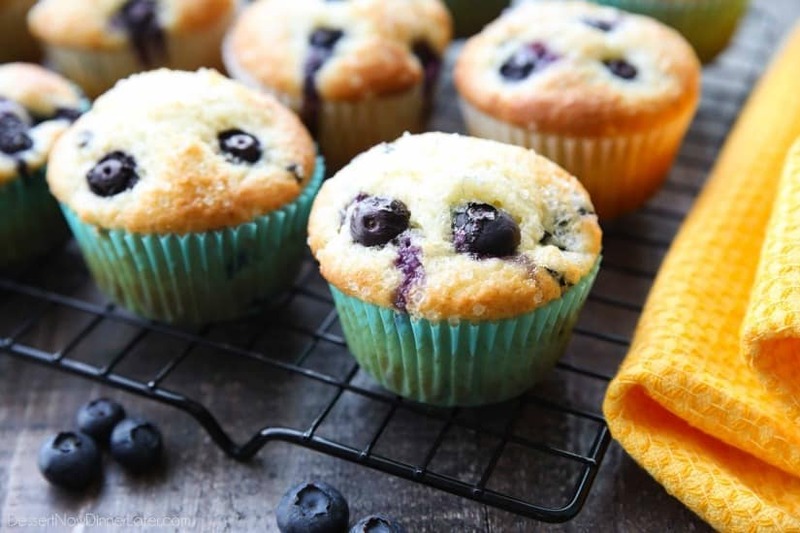 Blueberry Muffins - Dessert Now, Dinner Later! 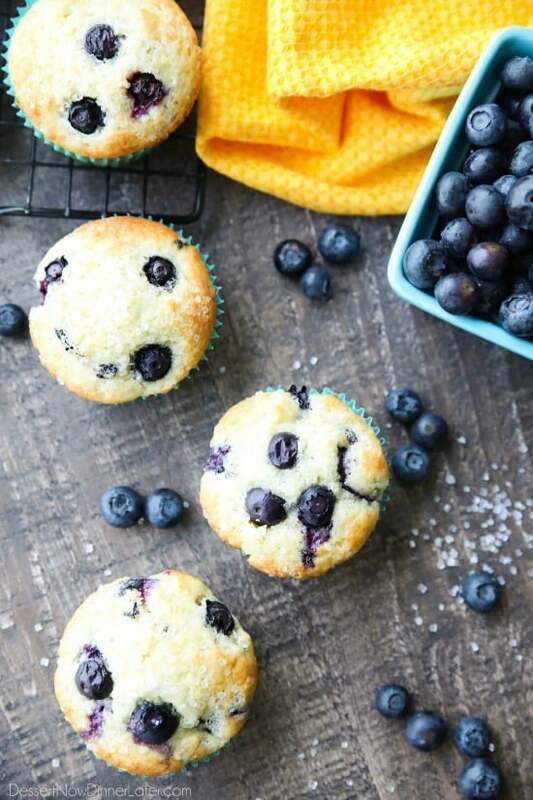 These Blueberry Muffins are so easy to make! 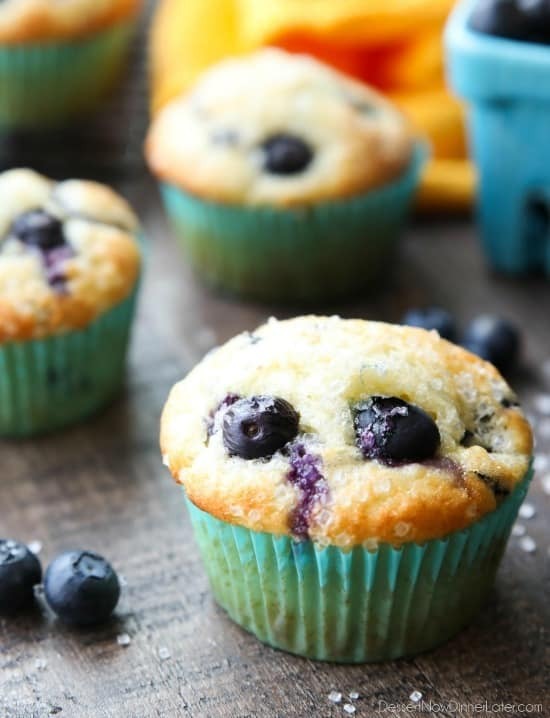 With plump blueberries throughout and coarse sugar sprinkled on top, you’ll love nibbling on these tasty muffins for breakfast (or brunch)! 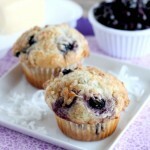 I tested these blueberry muffins THREE times to get them the way I wanted them. The first time was okay, but kind of dry and bland, so I adjusted the oil and sugar ratios. The second time was good, but flat on top and more brown, so I adjusted the oil and sugar ratios again, plus crushed up some blueberries. 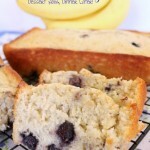 And the third time, they peaked on top, were moist, and tasted great, so I’m sharing the recipe with you! 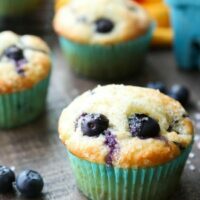 I have to admit that homemade blueberry muffins aren’t as strong in fruit flavor as bakery blueberry muffins simply because most bakeries use extract flavoring or what’s called “blueberry bits” to achieve that really strong blueberry taste. My alternative to achieve more blueberry flavor was to cut up some of the blueberries with my pastry blender. Then sprinkle some sugar on top to macerate the berries a little bit before folding them into the batter and it worked. I also tested some ways to keep the blueberries from bleeding. Tossing the blueberries in flour first, cornstarch second, and nothing third. They bled each way, but if you save a few to put on top for looks, they were more pleasant to eat without anything on them. The batter for these blueberry muffins is semi-thick, so I didn’t really have to worry about them sinking. FYI, tossing blueberries in flour may help prevent them from sinking if you have had that problem in the past. 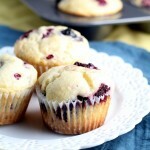 These blueberry muffins are good fresh or even a day or two old. If you eat them fresh, the tops are crisp from the coarse sugar sprinkled on top. They are still sweet and delicious after being stored in an airtight container overnight, if anything they are almost more moist the second day. Either way, I’m sure you will enjoy these. Preheat oven to 400 degrees Fahrenheit. Line muffin tins with paper cups. In another large bowl, whisk the eggs and 1 cup of sugar until thick and pale. Add the milk, oil, and vanilla. Combine wet and dry ingredients until almost combined. 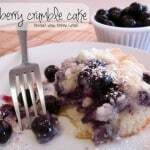 In a small bowl crush 1/2 cup of the blueberries with a pastry blender or fork, and toss with the remaining 1/4 cup sugar, until coated. Fold all blueberries (crushed and whole) into the muffin batter. Do not over mix. Scoop batter into the prepared muffin cups 2/3 full. Sprinkle with coarse sugar. Bake at 400 degrees Fahrenheit for 14 to 16 minutes until a toothpick comes out clean from the center. Store in an airtight container. *You may use any kind of milk. Whole or buttermilk is preferred. You can add 1 tsp of lemon juice or white distilled vinegar to 1 cup of regular milk to give it more of a tangy flavor like buttermilk. **I live in a high altitude. If you don't, consider increasing the baking powder by 1 tsp and baking at 375 degrees Fahrenheit for more time. Around 20-25 minutes. ***You may use frozen blueberries in place of fresh if needed, but fresh is recommended.